The following writeup was taken from the Optics.org website, with just a few changes. I first met Professor Bille when he was at Intelligent Surgical Lasers (ISL), developing a picosecond laser for intrastromal ablation. I’ve since followed his career through successive startups, including Technolas Perfect Vision and then 20/10 Perfect Vision. This Lifetime Achievement award is richly deserved. Josef Bille's development of the technology that underpins personalized laser eye surgery has won the University of Heidelberg researcher and entrepreneur a "lifetime achievement" award from the European Patent Office (EPO). 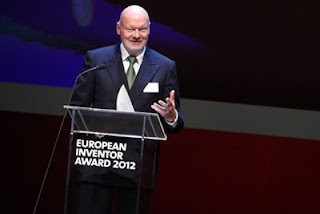 At the EPO's annual "European Inventor Awards", held in Copenhagen, Denmark, on June 14, Bille was recognized for more than three decades of work on wavefront correction techniques that have revolutionized the field of vision correction, created several start-up companies and now employ around one thousand people around the world. Laser-assisted in situ keratomileusis (LASIK), the most common method of refractive eye surgery to correct common defects such as myopia, was a relatively crude technique when first introduced in 1989. But thanks in large part to research work covered in patents filed by Bille, LASIK has evolved into a "tailor-made" technology, where the precise re-shaping of a patient's cornea is determined in much greater detail with the use of aberrometers to measure tiny defects, known as higher-order aberrations, in each eye. Subsequent developments have included all-laser LASIK - where femtosecond laser pulses are used in place of the traditional knife to create a "flap" under which the cornea is re-shaped, meaning more precise vision correction - and more recently the emergence of femtosecond laser cataract surgery, which is set to open up a much larger market for the technology. In his acceptance speech after winning the award, Bille said that he and his colleagues had tried to convey an atmosphere of entrepreneurship at Heidelberg. As well as five start-ups with which Bille was directly involved, his former PhD students have started up another twenty firms. "We described ourselves as the 'tip of the arrow' [Pfeilspitze]," Bille said. "Because we saw each other as a group of young people who can change the world." Bille first started working on wavefront sensing and correction in the early 1980s, after becoming a professor at the University of Heidelberg in Germany following a five-year stint in the chemicals industry. His original idea for wavefront correction emerged from work to develop a retinal imaging system that was first presented in 1982, and which led to a US patent filed in collaboration with the German optics giant Zeiss. Two years later, Bille co-founded Heidelberg Instruments, initially working on prototype ophthalmology systems - although the company, which is still going strong, is now firmly focused on laser-based lithography systems. Toward the end of the 1980s, Bille and his PhD student Andreas Dreher first demonstrated that adaptive optics could be performed on eyes in vivo, before making a key breakthrough in 1991. With another PhD student, Junzhong Liang, Bille demonstrated wavefront refraction with a Shack-Hartmann aberrometer for the first time - a development that has come to underpin the personalization of laser eye correction surgery. All in all, Bille has applied for 74 patents since 1982 - mostly relating to ophthalmology and eye surgery. Some of those have proved critical to gaining venture capital funding and protecting inventions that have led to the creation of several successful start-ups. In fact, says Bille, patents have been essential for the cross-over of those technologies into the commercial world. "To set up a firm there is a need for venture capital," he says. "But it would not be possible to obtain such capital if we had no patents. In fact, one could say that writing a business plan equates to writing patents." The Heidelberg professor has largely taken on that responsibility himself - even with the more recent emergence of university technology transfer specialists intended to speed the process. "Being professional at university technology transfer offices - fast, unbureaucratic - is an issue for a lot of universities in Europe and also in the US," he says, adding that part of the reason he writes his own patent applications is simply that it is fun to do. Nowadays, Bille adds, because of the increasing backlogs at patent offices, it has become the patent applications - and not so much the granted patents - that carry more influence. His strategy has typically been to patent first in the US with priority filings, largely because this is where the majority of venture capital firms are based, but also because US patent law has broader applicability, particularly for methods such as surgical procedures. Many of Bille's patents were written in conjunction with Technolas Perfect Vision (formerly known as 20/10 Perfect Vision, a company name referring to the way that wavefront measurements can correct eyesight to such a precise degree that patients become able to see better than the "20/20" typically considered to be perfect). Technolas is now part of the global eyecare giant Bausch & Lomb, and is focused on the emerging field of cataract surgery using femtosecond lasers, as well as laser correction of presbyopia. In an era of ageing global population, both of those applications look set for rapid adoption in the coming years. Of the five start-up to have been formed directly around Bille's work, three now employ around 250 employees each, and have a combined turnover of some ?300 million. Bille's recipe for success identifies four key elements: perseverance; close interaction with the users of the invented technology; an inclination to go against the grain and challenge conventional thinking; and, of course, an intellectual property (IP) strategy. The final part of that puzzle requires strong financial backing, however. "Venture capitalists' backing is essential in this context," Bille notes. There are two ways -- use the RSS feed to send updates to your reader, or subscribe to my Twitter account. I normally post all update posts on Twitter. I think this was a fantastic piece.